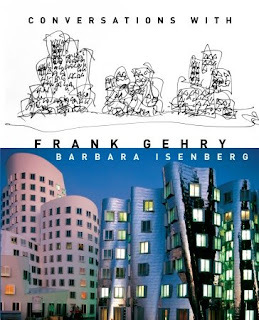 Barbara Isenberg’s new set of interviews with the world’s most famous architect, Conversations With Frank Gehry (excerpt; LA-centric excerpt), makes for a fascinating book, an oral history that describes Gehry’s humble upbringing and professional influences, discusses many of his projects, and allows him to elaborate on his values and sensibility. In that sense, it’s a complement to the 2006 documentary by Sydney Pollack, Sketches of Frank Gehry, which, though it covers less ground, can, by virtue of the medium, provide a more immediate sense of Gehry’s creative and competitive genius, and sometimes prickly and insecure personality. As one* reviewer concluded, "Gehry emerges in this self-portrait as a man of flesh and blood: unusually humble, painstakingly ethical, and frankly thrilled with the exciting prospects of modern art and architecture." Actually, half of one meaty chapter is devoted to Atlantic Yards, but the interview was conducted in 2005, generations ago in the AY saga. So Isenberg doesn’t make the effort to tease out the many questions regarding Gehry’s relationship with his client, his commitment to his principles, and perhaps even some second thoughts on this troubled, enormously controversial commission. She should have done so; interviews conducted in October 2005 and January 2006 already showed Gehry expressing self-doubt and feeling embattled. Now the economy has plummeted, the project has stalled, Gehry has laid off his AY staff, and the tension grows between artistic quality and corporate results. Gehry said in January 2006, "I think if it got out of whack with my own principles, I would walk away." How much more dicey has Forest City Enterprises’ DNA gotten? And is the project "out of whack"? Gehry, who built cities out of wood on his grandparent’s kitchen floor, did not have it easy, in both his upbringing and early career; indeed, Isenberg suggests that he handles fame reasonably well because it came so late. He stumbled at the Harvard Graduate School of Design. He found an openness and freedom in Los Angeles, a place where he was nurtured more by the art scene than the architecture profession, an enormous contrast to Toronto, the big city of his early childhood. Maybe. But if Gehry keeps calling Bruce Ratner a “liberal do-gooder” without a look at the broader context of Ratner’s hard-nosed business tactics, he won’t be getting many votes from Brooklyn. During the series of interviews, however, it’s clear that Atlantic Yards was a big deal for Gehry. Isenberg notes how the space and time at Gehry Partners varies by project, and at one point the office tables were covered with AY "models, photos and plans." True enough, and the test of time, as he's said, would be applied to the AY arena (should it get built). “It happens all the time--you compete, you get the assignment, and then you wait,” Gehry responds. That suggests he should have been reasonably sanguine regarding AY delays. Now that he's said he doubts the project would go forward however, he's gone to another level. Isenberg reminds Gehry he’d referred to Bruce Ratner as a good client. That was 2005. What would Gehry say now? Gehry describes himself has having “liberal political do-gooder leanings.” But those leanings, at least as shown in the book and film, do not connect to a sense of personal regret. He tells the now-familiar story about how, when working for the Rouse Company, a mall developer, the company’s president visited Gehry’s idiosyncratic house and asked how the architect could be comfortable working for him. Gehry said he did it to make a living; the executive said he didn’t think Gehry should do work he didn't want to do. That was a Friday night. But that devil seems more an issue of career gyrations than regret about laying people off. Gehry, in the film, is matter-of-fact about both that episode and the end of his first marriage. In the book, there’s no mention of the latter. Since the episode with Rouse, Gehry explains, he decided that he wouldn’t let any one one client account for more than half the work, though he’d prefer it no more than 35 percent. Indeed, he acknowledges that, with Atlantic Yards and the Beekman Tower in Lower Manhattan, his firm’s work with Ratner had exceeded the 35 percent mark, so he took on new clients--as his current clients understood. Gehry displays a certain amount of ambivalence toward the press, understanding how the media can both help and hurt. Then again, when Isenberg brings up the lawsuit filed by MIT against Gehry Partners and Skanska USA Building regarding construction and design failures at the Stata Center, Gehry gets prickly when she asks about leaks. “Why would you even give it credence?" he responds. Gehry not unreasonably suggests that the client could have come to him to ask for things to be fixed, and suggests that such problems were typically handled by insurance companies. Well, Gehry won't exactly take challenging questions from the press on AY, and his most recent statements were orchestrated via the developer’s office. The term value engineering has been bandied about recently regarding AY, but Gehry's had some bad experiences in the past. Though he designed Disney Hall in stone, after Bilbao, his clients wanted metal. That meant that reflections from the hall’s roof caused extreme heat nearby. That raises questions about the impact of value engineering on the AY arena, which may have something to do with saving money on safety glass. It may be a little late to save half a billion dollars, however. Isenberg deals with Atlantic Yards in a chapter that also discusses the Grand Avenue project in Los Angeles. She acknowledges that both mixed-use projects involved governmental involvement, delays, and, in the case of Brooklyn, "scrutiny from neighborhood residents, bloggers, and others." That final quote, published last month, was immediately contradicted by Ratner, and Gehry himself had to revise his remarks. What does he really think? Books have a long lead time, but still, readers of the book get updated only to the point of a March 2008 New York Times article in which Ratner acknowledged delays in the project but said the arena was on schedule. The arena, needless to say, is no longer on the schedule Ratner proclaimed. Gehry explains, as has been reported, that he met Ratner in the competition to build the New York Times Tower and Ratner was "now doing a project that entailed planning a large neighborhood. It was about six or seven million square feet including an arena, housing, and commercial space, and it was the kind of thing I’ve been waiting all my life to get to do." Planning a large neighborhood? Once, Gehry was more careful, saying he was designing a “neighborhood practically from scratch.” Isenberg might have brought up the “spaceship” analogy. Gehry, who at one point says the 17-building Atlantic Yards consists of 12 buildings, may just be a bit imprecise with facts. Atlantic Yards, as proposed, was to be an 8 million square foot project and, after increases and strategic decreases, was approved at roughly the same size. If it was always to be only 6-7 million square feet, that suggests that the size was overstated from the start. Gehry points out that he had a background in urban development, such as a high-rise housing tower for Rouse in Baltimore. Ratner, says Gehry, "had studied my work and realized I was an urban planner but hadn’t had the chance to do that." Well, don’t urban planners get to meet with the public rather than be kept at arm’s length by their clients? Gehry sounds a bit like he has assimilated a bit of Brooklyn Borough President Marty Markowitz, saying he embraced working in Brooklyn since he lived here as a one-year-old, his kids moved to Brooklyn, and "[t]he idea of bringing a sports team back to Brooklyn is very powerful, because they lost one. It’s been like a big hole in their gut since they lost the Dodgers, and I think Bruce is doing it for the same reasons. he loves that idea." There’s a real poignancy to some of the discussion, to Gehry’s (and Ratner’s) desire to build a better arena, a plan that convinced a lot of architecture critics. Ratner wanted an arena that had "the intimacy and relationship between the players and spectators that Disney Hall has between the orchestra and the audience. He told his partners they had to see Disney Hall and he brought them all out here to do that." In Los Angeles, he observes, the "Staples Center is a complete disaster.. it’s purely a money machine." OK, Gehry was apparently working on the challenge of moving large crowds into the building. He was not, however, solving the problem of traffic in the neighborhood. "He worked with many good architects in attempts to raise the bar for developers, but his parent company’s DNA is a little dicey. I kid him and say, 'The DNA is going to be counter to it," Gehry reports. Gehry goes on to say that he recognizes economic issues and can't just damn developers, "because he’s committed to doing something excellent. And he equally has to understand that there are aspirations in architecture that have to be fulfilled for me to be happy and for us to be mutually happy." That was 2005. What does Gehry think now? Gehry describes the relationship with the Department of City Planning as “we mostly see eye-to-eye.” He says Mayor Mike Bloomberg has provided a lot of support. So the stall must be painful. Isenberg points out that it’s a “huge undertaking” for Gehry to design the entire project himself. True enough, but Gehry’s name on all the buildings also would help them sell. So Gehry has the challenge of “a pluralistic approach,” which, at least from his discussion with Isenberg, involves a variety of window types as a way to distinguish buildings. However, the arena, $637.2 million as of December 2006, some 15 months later went up to $950 million. Now that the developer is reportedly trying to cut the cost in half, what went wrong? Could it be that neither Gehry nor his client anticipated the costs of meeting the security implications? Gehry takes pride in his sense of character, as well as the financial independence and acclaim that allows him autonomy. He recalls an episode while in the Army, an offer of assistance that could’ve been interpreted as a kickback, which he reported to the authorities. But by pulling out he would be expressing a simple truth: At this point the Atlantic Yards development has nothing to do with the project that New Yorkers were promised. Nor does it rise to the standards Mr. Gehry has set for himself during a remarkable career. What does Gehry think now? And has he given any thought to the government tactics necessary to deliver the project: the dubious finding of blight as a precursor to eminent domain. The book tour, for both author and subject, starts May 11 in an appearance at the New York Public Library. Tickets are $25 for 90 minutes, and music critic Alex Ross and Los Angeles Philaharmonic conductor Esa-Pekka Salonen are the other guests. • Is Gehry still working on the project? How actively? • What does he think about Ouroussoff's request? • How much has the project been compromised by cost-cutting? *The review noted above was for Library Journal, the magazine where I work, though not on the review side.